It’s always been a pleasure staging FingerTec products at our home base; always proud to inform Malaysians that FingerTec is a Made-in-Malaysia product. And just like in any other show we partake in, our presentation was moderate, aligned with our brand value: making things easy. 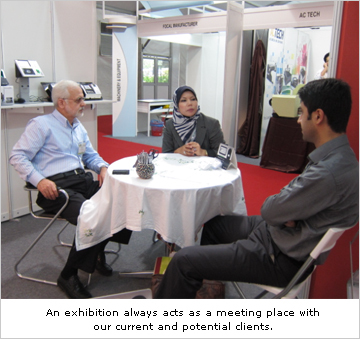 InTrade Malaysia is an annual event organized by Matrade, Malaysia External Trade Development Corporation, comprising of local and international exhibitors showcasing various products from a broad range of industries. 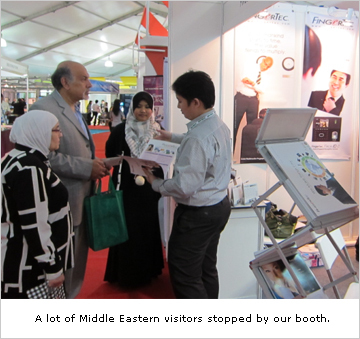 “One World, One Marketplace” was this year’s theme, as FingerTec took this opportunity to present our brand to the visitors. Located at Hall A, booth no 1732, FingerTec received a warm response from the visitors who averagely were not exposed to the commercial biometrics technology. TA300 was a great hit largely due to its competitive price, simplicity and design. Visitors were also drawn to Keylock 8800 and Q2i. The FingerTec Team also distributed our newly released 2011 TA300-designed calendar to exhibitors along with brochures of TA300 for brand awareness. “With a small budget I can actually automate my staff attendance. 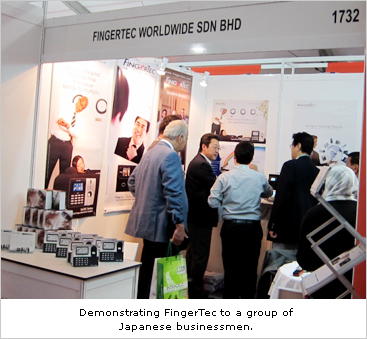 This is good to know,” commented an owner of a motorcycle shop in Kuala Lumpur who was interested in FingerTec’s TA300. FingerTec time attendance and door access products are suited to various industries and coupled with our loaded online resources, the brand is sought after locally and in the global stage. Copyright © 2010 FingerTec Worldwide Sdn. Bhd. All rights reserved.